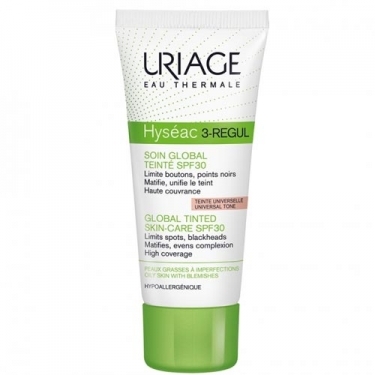 DESCRIPTION: Hyséac 3-Regul Soin Global Teinté SPF30 from Uriage is a moisturizing, seborgulatory and anti-imperfection cream with high sun protection for oily, acne-prone skin. 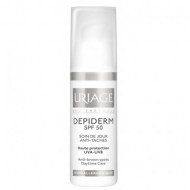 Formulated with extract of Licoricey that for its mattifying properties helps to limit the excess of sebum, often responsible for the formation of new imperfections. 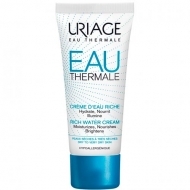 Limits bubbles and blackheads thanks to a high performance active complex (TLR2 Regul, AHA / BHA) and Uriage Thermal Water. 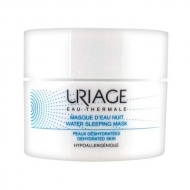 Constituents: Uriage Thermal Water, MPA-REGUl (new patent), TLR2-REGUL, LICORICE, AHA and BHA complex, Piroctone Olamine and Pore-refine. Hypoallergenic. Non-comedogenic. Ideal for oily skin.